The Gentleman Crafter: Folding The Page! Last night I played in my journal again! Love it! This morning I got up to finish it up. Now in the mood to cut some chipboard and get 3 dimensional! 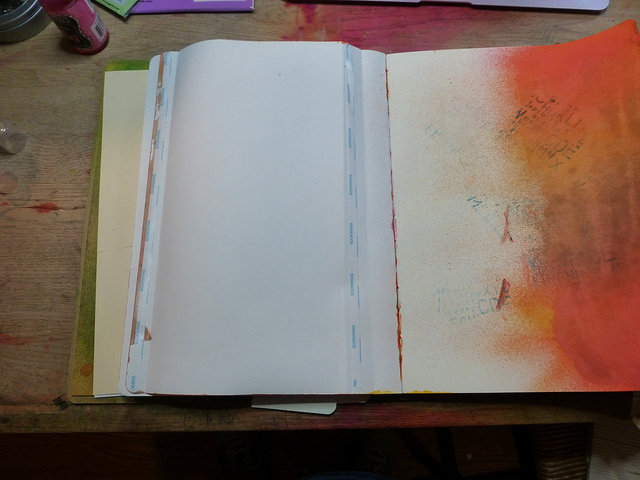 It's funny how you can be away from it for a couple of days and have this absolute need to get back to it...But first I thought I would share my art journal pages with you. I was trying to find a way to incorporate more tags into a page. So, I thought of something easy...folding the pages into pockets. With a little adhesive tape it was a breeze. Here's what I did....First, let me apologize for the darkness of the photos! I couldn't get the Aviary editing software to process the pictures! Go figure! Hahahaha! Me and technology! Good Grief Gertrude! You will need two journal pages to make this work. 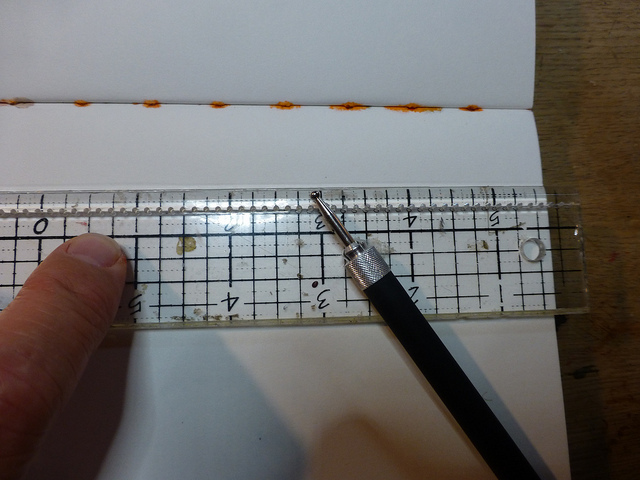 On the first page, I used my ruler and a stylus. 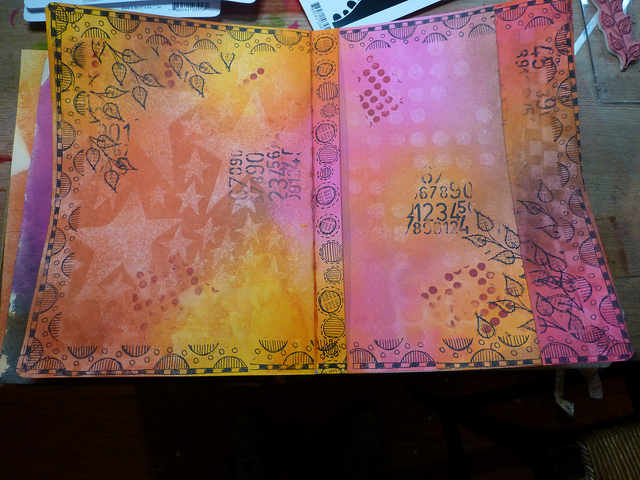 I scored from the center of the journal over to the right 1-inch. I then scored over from that score line to another 3/4-inch. Last, I scored 1/2-inch in from edge of the page. Fold on all the score lines. Now for a little tape....I used some score-tape on the backside of the mountain fold and taped the page together to form a little flap. Then I placed a small strip of tape on each inside end of the flap forming a narrow pocket. 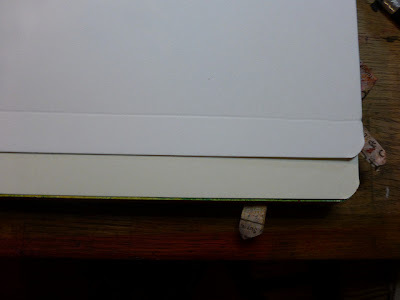 Next, I adhered the 1/2-inch edge down to the backside for a clean edge. 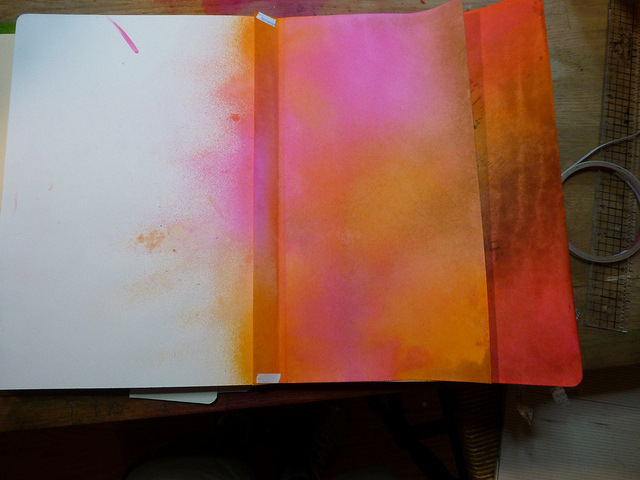 Last, I sprayed the edge of the second page with inks. 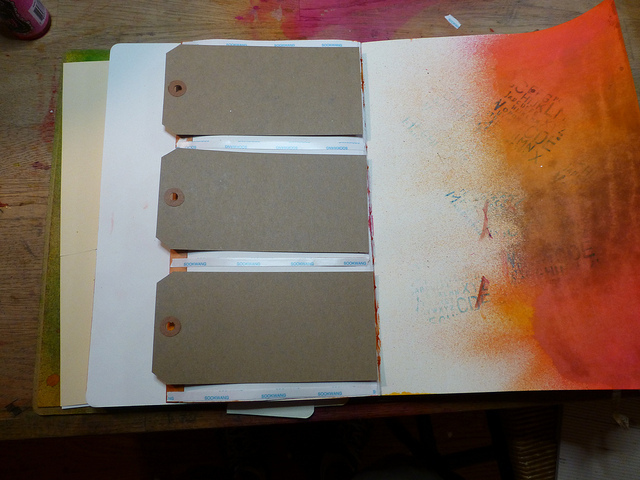 I then placed three #8 tags down to the backside of the folded page to get an idea of where I needed to place tape to form three pockets for the tags. Now, I normally wouldn't use tape for pockets as the tags will inevitable get stuck to the tape. However, the space between the tags and the tape were wide enough so I just did it. LOL! 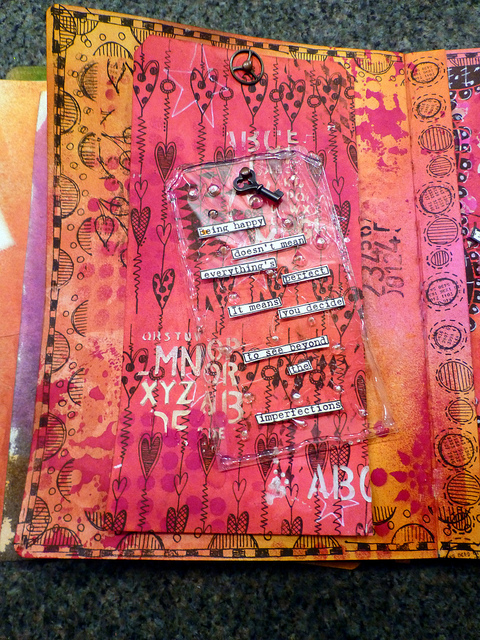 I pulled the tape backing and adhered it down to the second page and inserted my three tags and a larger #12 tag to the pockets. OK, off to get crafty with some chipboard...See y'all in a bit! By The Way...Happy Saturday Everybody! What a clever way to incorporate tags, Jimbo! I love those #12 tags...they are wonderful! Your pages are very cool, too! Great color palette! I may have to give this a try. Thanks, as always, for the wonderful inspiration. Jim....... You're just amazing... Love how you made this!!! Jim as I said on FB the creative part of your brain is just amazing. This is a fab, fab piece of art. Wow... this is awesome!!... thanks for posting all the pics and close up ones too!! Some times with journal pages it's hard to see all the details when the shot is of both pages. I'm surprised you could sleep at all with an un-finished page in the works... especially one that looks like it was really fun to make! Wow, look at you with all that pink! Love the pages! loving your journal pages! They are sooooo much fun!!! Got to get back to my journal! Gonna try this! Wish i could bottle you and Dyan and pour you out in my studio!!!! What I really like is the colour palette & look at that umbrella (?) character, brilliant!! i am thinking that this is soooo on my agenda to do today! thank you very much for sharing! Well you clever thing, you! I'm gonna have to give this a try. Thank you for the tutorial! Jim, this page set is fantastic! Absolutely love your colors and Dy's stamps are so fun. 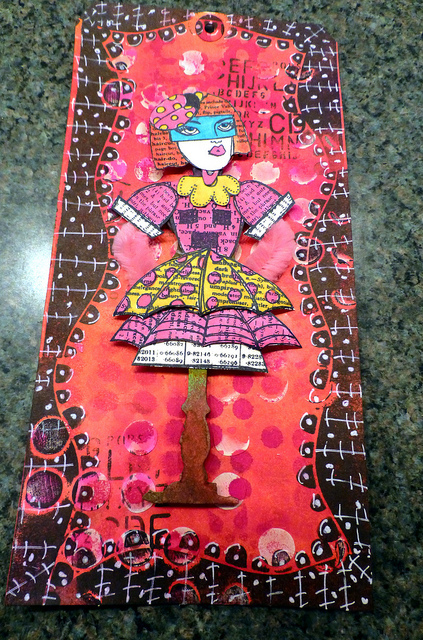 I can see I am going to have to start an art journal of my own ;) Thanks for the inspiration! 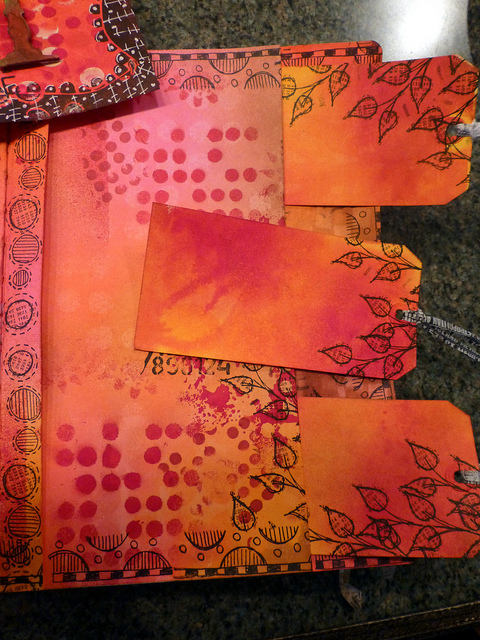 Fun colors and great way to incorporate pockets onto a journal page. thanks as always for sharing. 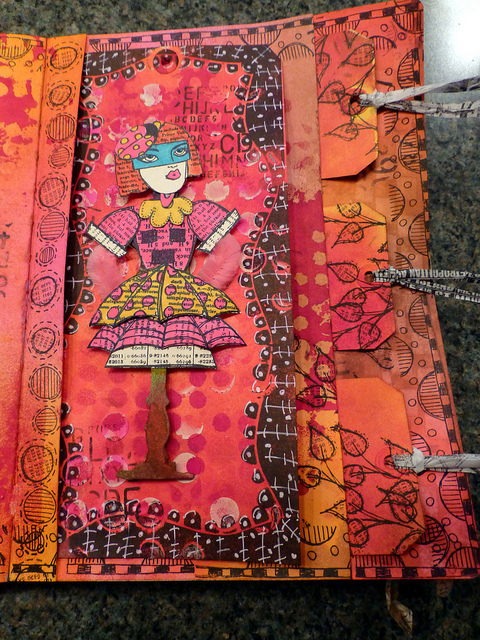 Your journal pages are so colourful and cheery - thanks for sharing! What a good idea! I especially like the skinny pocket for the big tag! 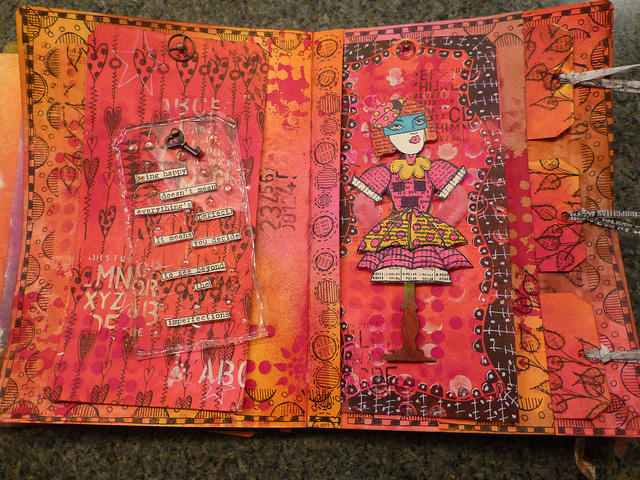 I love love love your art journal pages.......so inspiring!!!!! !